I was taking a bus back from Boston to New York today, watching the Connecticut landscape off I-95 go by through the window, and I caught sight of an apartment building with a window facing the highway. And I thought, Somebody lives in that apartment. I imagined that person—a man or a woman, not sure which—looking out the window at my bus as we shot by on our way to New York. And then he or she turned and looked back in the room, which I gave white-painted walls, beige wall-to-wall carpeting, a white-and-brass ceiling fan. I was conscious of imagining myself into this person’s head, looking out of his or her eyes, without choosing an identity other than the consciousness of being in someone else’s head; if I had looked in a mirror, I would have seen well-tanned skin, aviator-style glasses, short, curly, salt-and-pepper hair; or perhaps pale freckled skin, long, stringy auburn hair, a small nose and incongruously full lips. Either way, the me-in-this-imaginary-person’s head looked around for keys, turned off the lights, left and locked the apartment, and walked down the stairs to go outside to the parking lot, where a car was waiting. I imagined the view from this person’s eyes at every step, the fluorescent-lit hallway, the concrete steps down to the lot, the low chunk of the lock as it turned, the comforting support of the car seat. And once this person was sitting in the car, I let him or her go and came back to myself in the bus. I didn’t know who that person really was, whoever lived in that apartment, but the act of imagining, of looking out through his or her imaginary eyes, had made that person exist for me. He or she had passions, tastes, a history, a personality, loved ones, ones they are loved by, responsibilities, hobbies, a mind that works according to a certain education and ideologies, feelings as strongly held and as complicated as my own. Whoever lived there was as real as I was; and that realization knocked me back, as it always does, whenever I allow it to intrude on my daily life. Because it is so easy to go about my day thinking of all the random people around me as characters in a novel starring me, blips on the video-game screen of my life, and therefore as unimportant compared to me. But of course I am merely a blip on everyone else’s screen; and as I sat on the bus, I looked at the SUVs roaring along the highway next to us with drivers and passengers, then the people talking or sleeping or working all around me, and felt all those consciousnesses working away just as mine was, consumed with hopes and fears and dreams just like mine. I was reminded that everyone else is of as much worth and possibility to God or the universe as I am, and I find it profoundly humbling to sit and feel what that means every so often, my small place as one of the billions on this planet. And then to feel the empathy that grows out of that: for if everyone is like me, we are all uncertain, all damaged, all needful of kindness and mercy. Not that I can sustain this feeling all the time: As T. S. Eliot wrote, “Humankind cannot bear very much reality,” and I have to reassert my primacy in my universe in order to be able to function within it. But that meditative state has two useful applications for subjects often addressed on this blog. One, for fiction, I could create a character simply by turning those eyes inward toward the mind of the person I imagined in that apartment—to poke at that brain and see what secrets it held and who it revealed itself to be. Or to look out around the apartment, pick up the magazines and pick through the closets and open the medicine-cabinet door, and take all the clues those things offer as showing the soul that would choose them. The hard part is, of course, getting all those things on the page in an interesting way; but their creation starts with the pleasure of imagining and digging—of seeing this made-up person as real, and creating all the complications and contradictions that would support that. And two, for politics, this reminded me why I am a liberal. I support the right of gays and lesbians to marry because their loves and romantic relationships are as real as my own; I support welfare and S-CHIP and Medicaid and Medicare because the pains of poverty and lack of health insurance and the hard choices those force are as real (or actually more real) as any pains I face, and the Republicans’ all-sainted market offers no empathy at all. And if I in my incredibly blessed and comfortable New York life have to pay a little bit more in taxes so that a single mother in Texas who works two minimum-wage jobs gets food stamps, and her child gets milk and orange juice and a doctor’s supervision—that’s not actually patriotic, pace Biden; that’s common human decency, and worth it. I was in Boston for academic reasons of a sort: My friend Donna Freitas is a professor of religion at Boston University (and also the author of the excellent YA novel The Possibilities of Sainthood, in stores now), and because I knew she likes YA fiction that addresses religious questions, I gave her a galley of an upcoming novel I edited, Marcelo in the Real World, by Francisco X. Stork (due out March 2009). 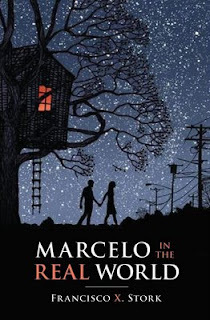 And she loved Marcelo so much that she put it on the syllabus of her Religion and Children’s Literature class at BU. Francisco (who lives in Boston) and I visited her class and enjoyed a terrific conversation about the book with Donna and her students. The students delved deep into the religious questions the book raises, of course—actually about just these points, on the reality and suffering of others, and our responsibility towards them. And it was fascinating to go into these thematic questions with them, because as an editor I so often get caught up in the purely practical aspects of making a story work—not just making sure a character gets from point A to point B, but that the character’s motive for going to point B is sufficiently drawn, that the effects of this journey reverberate in the lives of the other characters as they should, that there aren’t any unnecessary words or repetitions in the sentences describing the journey. . . . Francisco and I talked a great deal about the larger philosophical points of the book in working on it—in fact, in our very first official editorial interaction, I asked him to write out what he wanted the book to be about and the larger questions he wanted to address, and he came back with a three-page essay that shaped all the work we did on it going forward. But the last six months or so have all been back on the practical level, so it was a pleasure to revisit that thematic level again, and of course a pleasure to discuss Marcelo with people who adore it as much as I do. Finally, I strongly commend two things to you: One, this marvelous post by the Atlantic blogger Ta-Nehisi Coates on Obama’s grandparents, and the long history of people in our country who did the right thing when it came to race; and two, the BoltBus, which carried me to Boston and back again for less than $35 round-trip, and provided not just a clean bus and plenty of legroom but free Wi-Fi and a plug for my laptop. Bliss! In the Illinois state Senate, [Obama] authored about a half-dozen "major laws" on issues ranging from ethics to education. The best example of his leadership style was bipartisan legislation to require the videotaping of police interrogations, which is now a national model. Obama brought together police, prosecutors and the ACLU on a win-win bill that simultaneously increased conviction rates and all but ended jailhouse beatings. In Washington he has his name on three important laws: the first major ethics reform since Watergate; a much-needed cleanup of conventional weapons in the former Soviet Union, and the "Google for Government" bill, an accountability tool that requires notice of all federal contracts to be posted online. Besides that, Obama hasn't been around long enough to get much done. McCain . . . too, has authored fewer than a half-dozen major laws. Trying to fix immigration counts for something, but nothing passed. So while McCain deserves credit for the landmark 2002 McCain-Feingold campaign-finance reform bill, the only other major law . . . is the "McCain Amendment" prohibiting torture in the armed forces. But that has little meaning because of a bill this year, supported by McCain, that allows torture by the CIA. Under longstanding government practice, military intelligence officers can be temporarily designated as CIA officers ("sheep-dipped" is the bureaucratic lingo) when they want to go off the Army field manual. In other words, the government can still torture anyone, any time. For more on Obama, see this post from 2006 on the moderate political blog Obsidian Wings, considering all the legislation he had worked on up till that time. These next three links are also from Obsidian Wings; each one includes the number, title, and subject of all the legislation the two men have enacted or co-sponsored in the last two Congresses. Totals: Obama: 1 bill enacted, 2 on the calendar, 33 amendments; McCain: 2 bills enacted, 1 on the calendar, 19 amendments. Totals: Both cosponsored: 2 passed, 2 on calendar; Obama: 3 passed, 3 on calendar, 25 amendments; McCain: 0 passed, 6 on calendar, 7 amendments. Of course this isn't the whole story -- what laws they pass or sponsor is as important as how many they pass, and you need to read through the list to get those. I suppose it is no surprise to say I prefer the type of legislation Obama seems to be interested in ("S.AMDT.726 to H.R.3 To establish a program to award grants on a competitive basis to eligible recipients for the replacement or retrofit of certain existing school buses"; "S.AMDT.1290 to H.R.3057 To make funds available for the African Union Mission in Sudan"; "S.AMDT.1886 to H.R.2863 To make available emergency funds for pandemic flu preparedness. "), but you can make your own judgements. And I hope you do. So as I said, Melissa and I went to Pennsylvania yesterday to canvass for Obama. We drove out from Brooklyn that morning -- the New Jersey foliage was beautiful -- and gathered in a church basement in downtown Easton, in the Lehigh Valley. The canvassing office was well-organized, well-staffed, and well-stocked with doughnuts, bagels, and coffee. A bus came in from New York, and suddenly the space was flooded with people of all ages and races. We listened to our instructions, received our walk packet, and headed out to hit the streets with none of the pep rallying I heard before my Kerry canvassing four years ago, no drama or bombast. I guess we all knew how much this election means, and the focus was solely on efficiently, cheerfully getting the job done. Our territory was a new-looking subdivision west of town, with pretty houses, well-kept green lawns, and jack-o'-lanterns or Halloween decorations on every porch. Melissa and I split up our list and worked up and down nearly every street in the area. Even though I had canvassed before, I was always a bit nervous as I approached each door, and then usually happily surprised by the niceness of the people inside, even if they don't support my candidate. The vast majority of the people I talked to were Obamaites -- naturally, since I was using a Democratic walk list, but it was heartening anyway. The yard signs looked split 50-50. One housebound woman and her husband kept me talking with them ten minutes after my questionnaire was complete. Another woman took my hand, patted it, and thanked me for my hard work. I wondered whether the families inside these housing-boom mansions were worried about foreclosure notices, and tried to keep this line out front: "Are you better off than you were eight years ago? Do you think the United States is in a better place?" The answer to at least one of these questions was almost guaranteed to be a "no," which invited further conversation and a chance to make the Obama policy pitch. But when I met anti-Obamaites, they were never opposed on the basis of policy -- only on who they believed Barack was. One man I approached heard "Obama" and said immediately, "I'm not voting for him." "Could you tell me why not?" I asked, just in case he needed a little more information. I think my mouth nearly fell open, but I decided to make him say it. "Against what?" "Really," I said. I honestly wasn't sure if he was just teasing me or whether he meant it, so I decided to play up Barack's non-minority background just in case that made any difference. "Well, you know, Senator Obama is half white, half African American -- literally, since his father was from Kenya." I added a few more details out of Dreams from my Father (which I commend to any of you who haven't read it), about his grandmother and growing up in Hawaii. The guy shook his head. "I'm going to leave the country if he's elected. I was born in Lebanon and I'm going back there." "Some people would think that makes you a minority," I said, but he just shrugged. He asked the friend in the car with him if he was going to vote. "Nah, all those politicians are alike," the friend said. God knows I couldn't fix racism in a conversation, so I thanked them for their time and left. The other notable (to me) anti-Obama incident happened in the afternoon, when we were working over a different neighborhood north of town. By this time I'd put on an "Obama '08" button, and when my subject of the moment opened the door, the guy's eyes went straight to my button. "Oh, honey, I'm supporting McCain," he said. "And you ought to look into your guy too." I stopped. "What do you mean by that?" "He's got some real questionable friends." "Like who?" I said, waiting for William Ayers. But he went for Reverend Wright, so I brought up Charles Keating, then he switched tactics. "Rush Limbaugh says he couldn't even get FBI clearance." "Rush Limbaugh," I said, rolling my eyes. "There's a real fair and unbiased source." "Yeah, like Channel 2, 4, and 7 are so unbiased," he said, naming the CBS, NBC, and ABC affiliates out of New York with his own eye roll. "So what in his background keeps him from getting FBI clearance?" "I don't know, but he can't get it. You can look it up." "Fine, I will," I said, and I left. And when I got home, I did look it up. Obama hasn't actually been denied FBI clearance, and given that he's a Senator in line for the Presidency, he probably already has much higher clearance than that. The right wing just likes to allege that he couldn't get the clearance to become an FBI agent if he applied to do so. This is because the FBI investigates past drug abuse and association with "undesirable persons" as part of its background checks for security clearance, and both of those categories could potentially indict Obama. But per Dreams from my Father again, Obama last used drugs more than twenty years ago, and his associations with Rev. Wright and William Ayers have been thoroughly documented and do not seem to have had any lasting affects on his political thought. Over dinner later, I posed the questions to Melissa: Would you rather have a president who has a reprehensible personal life (fill in your own definition of "reprehensible" here) but policies you agree with 100%, and a good chance of getting them passed if elected? Or a president with a model personal life, but policies you agree with only 55%? I voted for reprehensibility and policy agreement, pending the particularities of the reprehensibility. . . . I do not think Obama's had a reprehensible personal life, for the record, but it's an interesting theory question, as it was an interesting day. Yesterday Melissa Anelli and I spent a fascinating, exhausting day in Pennsylvania canvassing for the Obama campaign (more on that later tonight). Back in New York, we treated ourselves to a musical -- the incredibly funny, smart, self-reflexive, and, sadly, now-closed [title of show]. It's about four friends struggling to write a musical and get it produced, first at the New York Musical Theatre Festival, later off-Broadway, and finally *on* Broadway. It's performed by the two men and two women who created it, and a great part of the pleasure of the show was knowing that we were watching the "good guys" -- the people who struggled with all the difficulties of creativity, money, self-doubt, others' doubt and judgment, paralysis, procrastination, etc., in the name of their art and their love of that art -- and now they were living the dream on Broadway, visibly exhilarated by it. This number was one of my favorites, all about that self-doubt and how creative people have to work to overcome it: "Die, Vampire, Die!" Kevin Crossley-Holland's CROSSING TO PARADISE is the American edition of his book GATTY'S TALE. It is a standalone followup to his Arthur trilogy, which brilliantly combined Arthurian legend with an incredibly rich medieval coming-of-age tale. It is the story of Gatty, a peasant plucked from the fields for her beautiful singing voice and chosen to accompany a fine lady on her pilgrimage to Jerusalem. And it is simply glorious writing -- character-driven, sensuous, atmospheric, with a poet's eye and ear for detail and language and a historian's appreciation for the nuances of medieval life and behavior. These are two of my favorite excerpts from CROSSING, one from the beginning of the book, before Gatty sets out on her journey, and one from the end, at its pinnacle, in the Holy Sepulchre in Jerusalem. (My absolute favorite scene is the last one, but that would be telling.) You need to read the entire Holy Sepulchre scene to get its full beauty and effect, but I hope this might give you a sense of Kevin's descriptive language. And as for his characters. . . . Note that in this first excerpt, you learn everything about who they are and what they want solely from their dialogue, with no fancier dialogue tag than "replied." CROSSING TO PARADISE has received three starred reviews and was shortlisted for the Carnegie Medal earlier this year. If you'd like to find out more or order the book (hint, hint), check out its page on the Arthur A. Levine Books website. In the afternoon, Gatty found Oliver in the church vestry. He was sitting at his sloping desk, his feet on a footstool, writing on a piece of parchment. “There you are!” said Gatty. “In the service of the Lord,” Oliver replied. “Who are you writing to?” asked Gatty. Oliver completed the character and then the word he was writing. Then he rolled up the little scroll and gave it to Gatty. “Easy is wrong,” said Oliver. Oliver pressed his lips together. “Go on, then,” he said. Gatty gently shook her head and then, very boldly, she laid the flat of her right hand on Oliver’s back. Oliver looked up at Gatty, so eager, her eyes shining. He knitted his brows. “Just what are you to Arthur?” he enquired. “Yes,” said Oliver. “True.” He wrote four more words, and voiced them as he wrote. “If he gets home,” the priest replied. “I know what,” said Gatty. Then she untied the violet ribbon she wore day and night round her waist, the one Arthur had bought for her with his last farthing at Ludlow Fair. She doubled it, tore at it with her teeth and bit it in half. “Really!” said Oliver, wrinkling his nose. “Half for him, half for me,” said Gatty. So Oliver rolled up the little piece of parchment and Gatty secured it with the violet ribbon. She smiled brightly at Oliver and then she wound her half of the violet ribbon round and round her left wrist. For a long time Gatty stayed in the rock passage, alone. The shouting became more distant, more occasional. Then she heard a thud as the great doors were closed; she could even hear the crunch-and-scrape of the key in the lock. After this, there was nothing but the sound of silence: that, and the rock’s husky voice when Gatty rubbed a shoulder against it, or wiggled the heel of her boot against it. The double thump of her heartbeat. A slight whistling in her right ear. Poor Snout, she thought. He’s lost me again! He’ll guess, won’t he? He’ll understand. Still Gatty bided her time, brave and cautious as a hare. Then at last she tiptoed down the twisting passage and a few steps out into the hall of night-sky, heart of the warren, chamber of echoes. Around her head, this massive building soared and stood like plates of armour, grand and unshakable. Gatty craned her neck and looked upwards and sideways; she looked all around her; and after a while this church, Holy Sepulchre, began to seem more like a mantle than armour. A strong cloak to shelter and protect her. And yet, she thought, it’s all incense smoke, all candlelight. Shimmering and trembling. As though it scarcely exists. Text (c) 2006 by Kevin Crossley-Holland. My mother is making a t-shirt quilt for a breast cancer fundraiser, and to fill it out, she would like to collect a wide variety of Susan G. Komen Race for the Cure t-shirts -- different years, different colors, different designs, different venues, etc. I'm sending her the New York shirts from 2008 (orange and pink) and 2007 (pink and gray), and she has a number of Kansas City shirts; if YOU have a Komen t-shirt you'd be willing to donate to the cause, we'd be very grateful. Drop me a line at chavela_que at yahoo dot com (or leave a post on my Wall if you're reading this on Facebook), and I will supply mailing information and my gratitude. My website, www.cherylklein.com, is now on a new, non-Verizon server. If you had any of the individual pages bookmarked, you may want to go to the website and update your links -- or, if you'd always wanted to bookmark a page but not been able to, you can now! My very great thanks to John Noe and Alex Robbin of the Leaky Cauldron for helping me out with this. I hope to do a total site redesign later this fall, so keep your eye on that page.